Bringing together some loose threads . . .
‘Fabric’ was the theme of the Australia ICOMOS 2015 annual conference, held at the National Wine Centre in Adelaide in early November. Richard Mackay facilitated the conference plenary session at which ideas from the three themes: ‘conserving fabric’, ‘fabric and place’ and ‘social fabric’ were brought together in some animated discussions. Keynote speaker Julian Smith, Executive Director of Canadian Willowbank, Canada, highlighted the importance of a ‘hands-on’, almost visceral, understanding of fabric and traditional trades. Peter Cox, Chair of ICOMOS Ireland and the ICOMOS International Scientific Committee on Energy and Sustainability, spoke eloquently of both embodied energy and the inheritance value of cultural fabric, noting that ‘there is nothing greener than an existing building’. 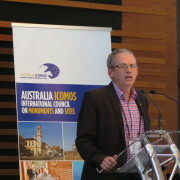 Prof Neale Draper from Australian Cultural Heritage Management connected the gathering with surrounding Country, noting the need to recognise the role of social fabric and particularly the relationship between Australian Aboriginal and their important places. Susan Macdonald, Director of Field Projects at the Getty Conservation Institute, highlighted a global trend for less public sector involvement and support – meaning that models and practices for fabric conservation were changing. Richard Mackay noted the interesting way in which the conference had evolved from an initial focus on physical fabric and conservation techniques, towards a broader contextual understanding of the relationship between fabric and place, particularly towards social fabric and meaning. Nevertheless, fabric was recognised as an anchor which ties heritage places and their meanings together. Loss of traditional knowledge in heritage trades, the need for new sustainable approaches and the declining role of government are therefore major issues for heritage practice in Australia today. Ultimately, the ‘threads of fabric’ in the plenary discussion came together in a common understanding that it is the nexus between fabric and meaning which creates heritage value. http://www.mackaystrategic.com.au/wp-content/uploads/2015/11/IMG_1325.jpg 3000 4000 Richard Mackay http://www.mackaystrategic.com.au/wp-content/uploads/2015/09/mackay-strategic-web-logo-300x103.jpg Richard Mackay2015-11-24 11:27:592017-11-24 08:47:22Bringing together some loose threads . . .